• 1750 sqft , 3 bath , 4 bdrm single story – FOR SALE CAD449,900 . PEACE, TRANQUILITY AND PRIVACY AWAITS AT THIS LOVELY BUNGALOW WITH WALK-OUT BASEMENT! Located on a treed 2.3 acre acre lot at the end of a cul de sac, this property offers all of nature at your doorstep and a magnificent setting to relax and unwind. The paved driveway leads you to the property tucked back behind the trees. Upon entry, you will be greeted by 9ft ceilings and open area leading to the stunning kitchen with cabinets that go up to the ceiling, large island with sink, granite counters, beverage fridge, seating. The dining area and the living area with propane fireplace make this space ideal for family time together or entertaining. This open area has large windows giving views of the backyard. Access the covered deck + patio off the dining area. The beautiful master bedroom has a walk-in-closet and 5pc Ensuite that consists of a custom tiled shower, heated floors, double vanity and jetted tub. Two other bedrooms and 4pc bath complete main floor. Down the walk-out basement is a large family-games room (has plumbing for future bar), living room (used as theater room), 4th bedroom + 4pc bath. Patio doors lead outside to the stone patio with gazebo. There is storage available in the utility room. Also, there is an attached double car garage. 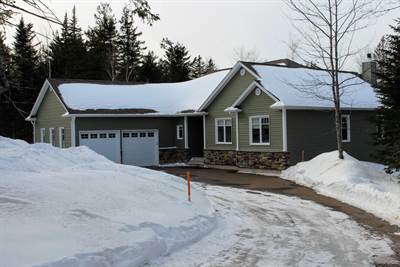 Features: Forced air furnace, heat pump, propane fireplace, wood stove, ceiling speakers throughout, alarm system, central vac, baby barn. Call today to schedule your visit!